between two consecutive crests or between two consecutive troughs. When all the particles vibrate in one plane, c> g the plane of the drawing, the wave is said to be polarized in a plane. The velocity of propagation of the wave is the distance traveled by any given crest in one second. same motion as that of the pendulum or tuning-fork from which the disturbance starts. 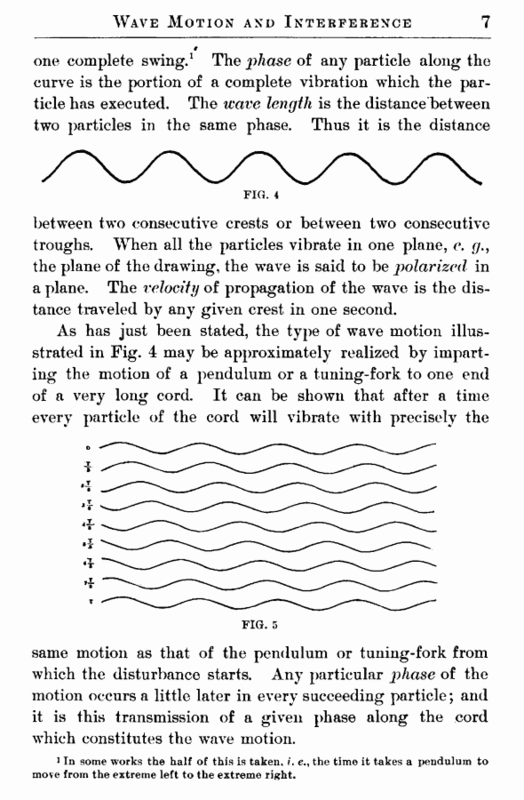 Any particular phase of the motion occurs a little later in every succeeding particle; and it is this transmission of a given phase along the cord which constitutes the wave motion. i In some works the half of this is taken, i. e., the time it takes a pendulum to move from the extreme left to the extreme right. Very elementary considerations show that the length (I) of the wave is connected with the period (j>) of vibration of the particles (the time of one complete cycle) and the velocity (r) of transmission by the simple relation I = pv. 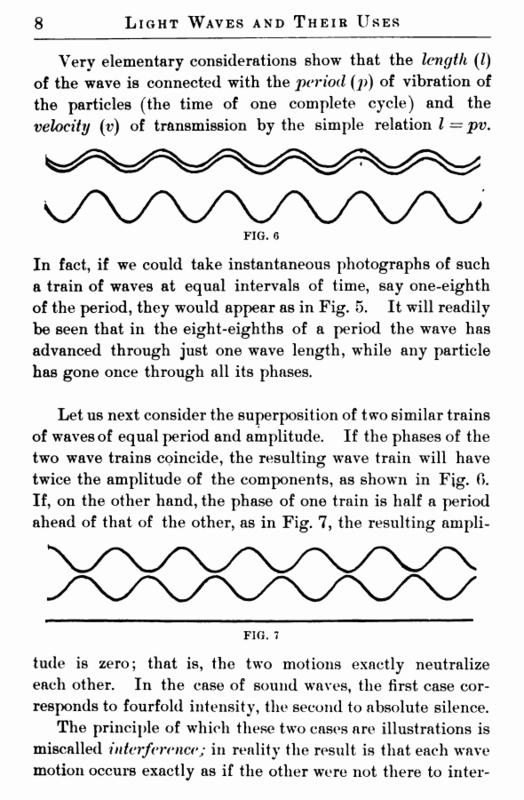 In fact, if we could take instantaneous photographs of such a train of waves at equal intervals of time, say one-eighth of the period, they would appear as in Fig. 5. It will readily be seen that in the eight-eighths of a period the wave has advanced through just one wave length, while any particle has gone once through all its phases. iude is zero; that is, the two motions exactly neutralize each other. In the case of sound waves, the first case corresponds to fourfold intensity, the second to absolute silence.